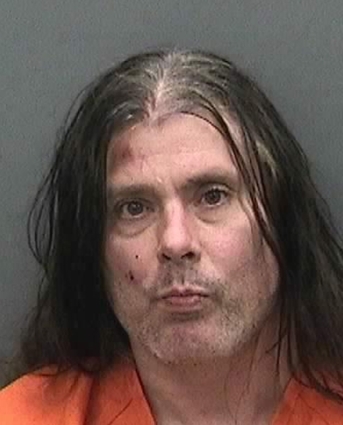 Newly released court documents show that CANNIBAL CORPSE guitarist Patrick "Pat" O'Brien made strange phone calls to his parents the day of his arrest, warning about "the rapture" and telling them that "aliens have landed." O'Brien allegedly broke into a Northdale, Florida home on December 10 and shouted that "the rapture is coming" before pushing a woman to the ground. He ran toward a responding deputy with a knife and was subdued with a stun gun. Less than half a mile from where O'Brien was arrested, a fire broke out at the house he was renting, sending flames billowing into the night sky from the roof. According to the Tampa Bay Times, fire marshals found a large cache of weapon, locked safes and potential explosive devices inside O'Brien's home. The stash included about 50 shotguns — including one with a barrel illegaly sawed off to about an inch past the stock — 10 semiautomatic rifles including a couple of AK-47 variants, two Uzi-style rifles and 20 handguns. Also found at the house were two flame throwers as well as thousands of rounds of ammunition — stored in boxes, military-style metal cans and even ammunition belts — several other weapons and weapons parts and three skulls. The day after the fire, a neighbor told News Channel 8 they believed O'Brien kept some sort of flamethrower at the house and practiced with it. The owner of the home where O'Brien was arrested wouldn't go on camera but told ABC Action News he thought the guitarist was hallucinating when he spoke to him and claimed "someone was after him." The homeowner added O'Brien seemed scared and at one point even hid in his closet. O'Brien was released from Hillsborough County jail on Friday, December 14, after posting a $50,000 surety bond. CANNIBAL CORPSE announced last week that it would be part of the next North American leg of SLAYER's farewell tour.